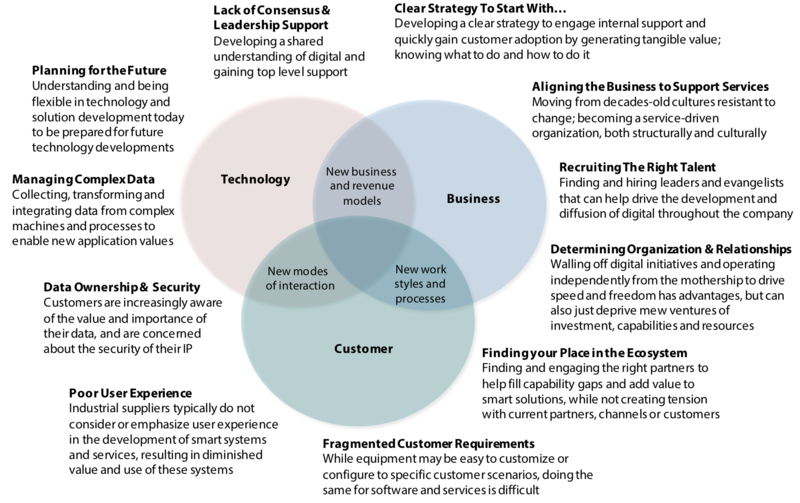 This paper identifies new forces acting on players and markets and seven key growth themes that tie closely to future OEM competitiveness which, in turn, are tied to several technology trends we believe will enable new customer solutions and new non-traditional growth opportunities. Digitization and the continued evolution of Smart Systems technologies will impact virtually every dimension of any OEM’s growth strategy and operating model and will likely make the business look and feel very different in the coming years. usage information from their equipment. As the Industrial OEM arena evolves past the last several turbulent years, multiple forces [such as global economic expansion] are likely to contribute to positive growth in the short to moderate term. The overall health of the global economy and global gross domestic product (GDP) growth historically tie closely to the growth of machines and capital equipment. For leadership teams in OEMs, identifying and understanding key forces and trends and their potential impacts on their specific product, machine or systems segment, will be critical for sustaining growth and performance in the long run. Management in equipment manufacturers and machine builders will face tough trade-off decisions related to new technology and innovation investments as well as rapidly evolving business and operating models. » Capital is increasingly available and abundant. The scale of financial assets is now roughly 8-10 times global GDP, making unique skills and new innovation concepts far more important than capital formation and also, are the true constraint on an OEM’s ability to drive new growth. » Industries are consolidating into a “winner-takes-all” mode. Virtually any product or services segment likely had twenty or more significant competitors thirty years ago. Today that number is typically 3-5 globally dominant leaders in each segment collectively earning as much as 75% or more of the profit pool. We would describe all of the above trends as “classic.” What we mean is the relationship of these trends to an OEM’s core product business is predictable. For OEMs to succeed in their core product businesses they will need to continue to carefully set priorities and investments to address prevailing trends in the marketplace. Innovation for the core business is, for the most part, sustaining, incremental and continuous. Performance measurement, repeatability, risk management, continuous improvement and financial discipline are the minimum requirements to help drive a continuing cycle of improved costs and higher levels of customer support. However, we believe new digital and Smart Systems technologies will have an out sized impact on OEM’s strategy and begin to turn long held beliefs upside down. For example, many managers believe that you can be big and low cost, or you can be focused and differentiated— but not both. Today’s Smart Systems and IoT technologies are enabling new modes of services delivery and creating new opportunities with data and analytics capabilities that either significantly reduce, if not eliminate, this classic strategic trade-off. This, we believe, is but one example of the extraordinary effects new systems technology will have on OEMs.